What is better than singing songs with children? Singing songs which teach of course! I have selected a book which illustrates a song we all know, adding a few silly details along the way. 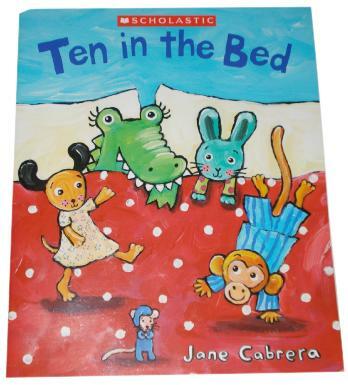 Ten in the Bed will have children counting backwards from ten in no time. They will love seeing the ten animals fall out of bed, one by one. The animals' roles range from pirate to ballerina, with an astronaut and a doctor among them too! The animals end up dancing about. Encourage children to do the same...at least for a few seconds before you read the end of the story. When children have spent any excess energy they may have, read the last few pages. The little mouse screams and shouts out to everyone to settle down. This can be children's signal to sit down and you should not hear a sound, not a peep... just like in the book! This is actually great to practice the transition between excited and calm. Read the story every morning throughout the theme for extra fun and extra practice!